^ Alderson, Andrew (11 November 2001). "'They really do look as I'd imagined they would inside my head.'". Telegraph.co.uk. Telegraph Media Group Limited. Archived from the original on 13 March 2007. Retrieved 13 March 2007 – via Accio Quote!. ^ Lydon, Christopher (12 October 1999). Forchhammer, Troels (ed.). "J.K. Rowling interview transcript". The Connection. WBUR Radio. Archived from the original on 3 September 2003. 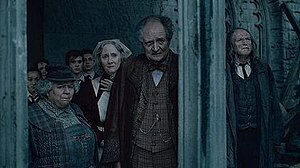 Retrieved 4 January 2019 – via Accio Quote!. ^ Gray, Mike (2001). Shanthakumar, Ashmita; Bartlett, Bridget (eds.). "Deathday party other ghosts essay: the Hogwarts Ghosts". The Harry Potter Lexicon. Warner Bros. Archived from the original on 16 January 2004. Retrieved 4 January 2019. ^ Rowling, J. K. (28 June 2016). "Ilvermorny School of Witchcraft and Wizardry". Pottermore. Wizarding World. Warner Bros. Entertainment Inc. Retrieved 4 January 2019.